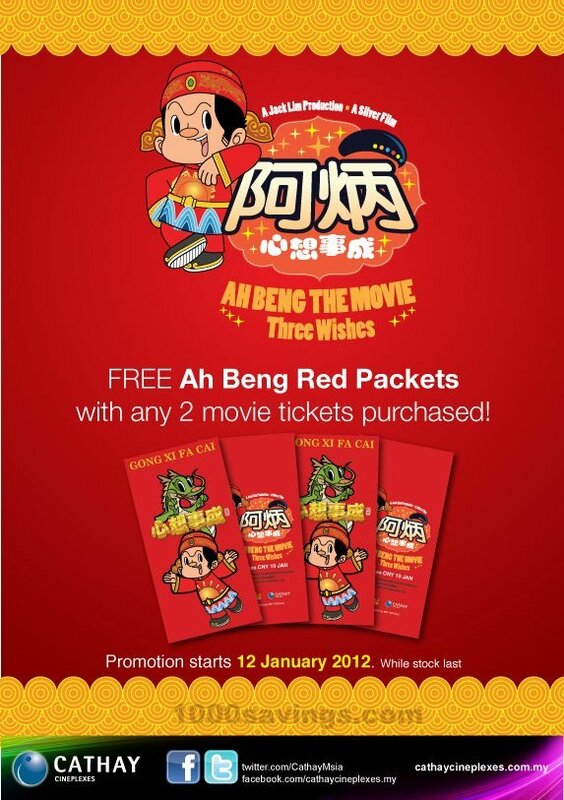 FREE Ah Beng Red Packets with ANY 2 movie tickets purchased @ Cathay Cineplexes eCurve, Damansara! with ANY 2 movie tickets purchased! Date: 12 January 2012 till while stock last! Ah Beng, Ah Lian, Rain, Bobby and Salted Fish Lian are coming to the big screen CNY 2012. The eve of The Lunar New Year, every household in a village is busy preparing to receive the auspicious God Of Fortune (GOF). Ah Beng's father being poor can only give coins and a scruffy GOF, who is in fact, the true and almighty GOF is touched by Ah Beng's father's sincerity and grants him 3 wishes. Not-so-bright security guard Ah Beng is being bullied by a group of rich brats. A mysterious guy comes in and helps Ah Beng. Grateful for his help, Ah Beng invites him into his life and things starts to change around him. Ah Beng The Movie: Three Wishes is coming to cinemas on 19 January 2012 onwards.